The first of these quizzes was well received, so it is time for another. Here are 12 album covers (CD sized) sitting on top of an LP. How many of the 13 Albums and Artists can you name? Sure, tell me how many you could identify, but only write down two answers in the COMMENTS section below. OK? NOTE: If you want to enjoy the quiz for yourself, don’t look at the Comments! Tell me your total score, but only write down two answers. I got 3.5. I’ll save the answers for now and let other people look. I could only name seven titles, But also recognized two artists (but could not name the album). And three I could not Identify. Band on the Run and Tommy. I love these! if we name them all, do we win them? Absolutely. Just print out this page and take it to your local record shop. They’ll fill a bag with your winnings. 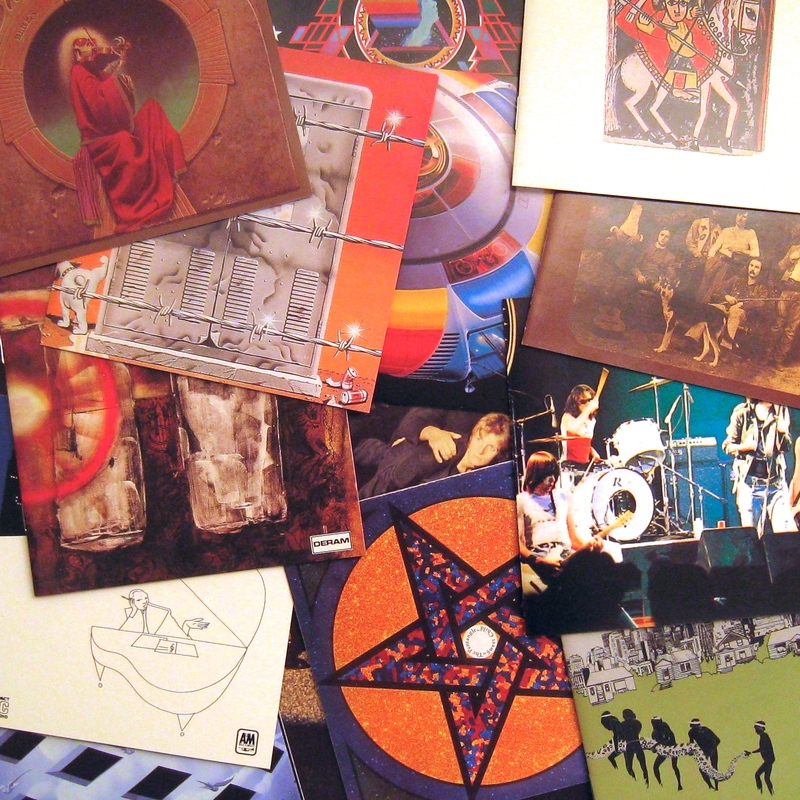 Only got two of them all up, and they were the Grateful Dead’s `Blues for Allah’ and Hawkwind’s `In Search of Space’? Love it! I scrolled down looking away from the screen so I haven’t peeked if any answers have been posted already – I’ll send my submissions (thanks for mentioning the quantity of 2 – there are only 2 I feel confident about!) once I’ve had more chance to ponder! And Band on the Run/Graceland is all I’ve got, even upon further pondering! I got 5. So, my 2 correct answers are : Paul Simon-Graceland and CSN&Y – Deja Vu. I got 11…10 off the top of my head and 1 with a little research. Looking forward to finding out about the other 2. (Actually, I just saw one of them in the comments, so I’m almost there). Should we be emailing you our answers? If you wish, you’re welcome to email me your whole set Rich. Or add 2 more (just 2!) to the above progressive tally via these comments. What’s your email address, Bruce? Just emailed it to you Rich. So, Rich: 10 unassisted and a further 2 via other means. Most impressive! I’m very proud but I’m sure someone out there will get all 13. Thanks for letting me know (via email) about the one I missed. That was a complete stumper. Nice one. Thanks for joining in. Spotted 8. My two selections are ELO Out of the Blue and the Joni Mitchell Hissing of Summer Lawns are two I was almost certain someone would point out. I think Rich probably spotted Two of the other ones I am thinking of since I beleive he has done series on them. I could be wrong. 8 is a most respectable score! Thanks for adding two more artist/titles too. 9 and 2 half’s – no idea about 2! Good result! Hope you enjoyed it. Yes i did thanks and i still made my train! Is that an Australian AC/DC in there? High Voltage? I’m getting about 8 of the artists bit only 4 that I can remember the titles of without cheating! Nice work. AC/DC – High Voltage was one that stumped most. And yes indeed, balancing Bon’s Yang with some Jacqui Yin is Pentangle’s Sweet Child. Awesome! I knew it was Pentangle but want sure if it was that or Basket of Light. Lucky guess. I think that actually makes me 8 for artists and 5 for titles then. Dammit! I must be going senile! At first glance I only recognised 3. You were very sneaky not putting any Cliff Richard or Brotherhood of man albums, I notice. Sneaky indeed. Next time for sure. I know seven of them, and will name Paul Simon’s Graceland and ELO’s Out of The Blue. Graceland (Paul Simon) is duly recorded. As ELO already had a mention, is there something else you’d like to add JDB? I like these. Late to the party, but spotted 8 I recognised, 4 I could name without the need for Wikipedia! Sorry, your invite must have been delayed by heavy traffic in the time zones. I think the next one, I’ll suggest people name their total for ‘Unassisted’ and ‘Researched’. What do you reckon? I’m disappointed no one has mentioned Joe or the Forest Hills punks. Thanks to everyone who participated. Hope you enjoyed the quiz. ← DARK SIDE OF THE WHOM?